My friend Miles says that in Dayton, Ohio the “Switch Witch” comes to visit many of her fellow parents houses the night after Halloween, leaving toys in place of sweets. There’s always bribery. I hear many parents follow the example of the dentist I heard about on NPR: offer to buy the crap to keep it out of their kids tummies. In the case of the dentist, the going rate was $1 per pound, up to 5 pounds. Not bad! I’m pretty sure my Mom adhered to the “Out of sight, out of mind” policy, in which we would eat one piece of candy after dinner for a week or so, and then we’d forget all about it. The remainder would, I’m quite certain, end up in the trash well before it was time to worry about pumpkin pie and cranberry sauce. I know at least one family who simply opts out altogether. They stay home and pick a special family dessert to make instead. Even if you’re not convinced that sugar is a toxin, most parents seem to get that consuming candy on Halloween-scale is not good. Maybe it’s because of the unfortunate kid every year at the parade or the party who overdoes it and throws up, or maybe we just know, instinctively that consuming a pillowcase full of anything, anything at all, can’t be good. 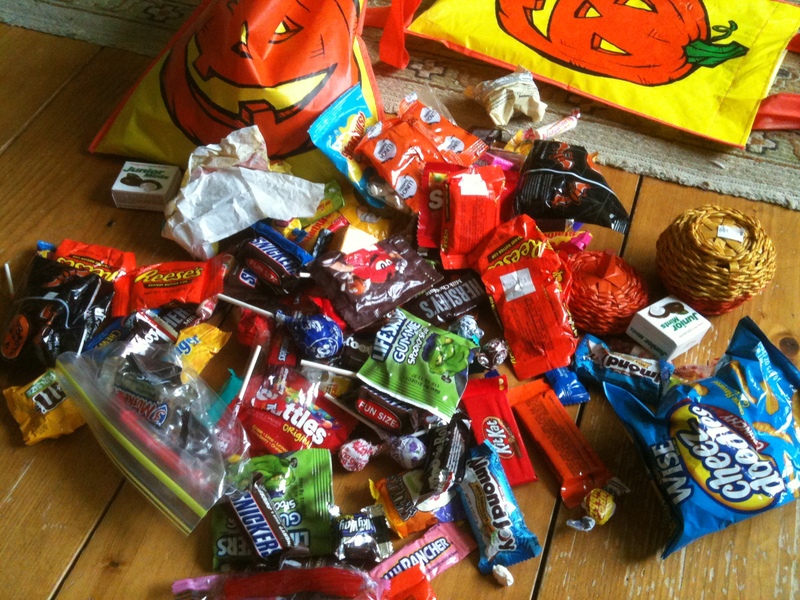 Of course, nobody eats ALL their Halloween candy, do they? Here’s what we always used to do when I was a kid: after trick-or-treating till our lips turned blue from the late October air (“Mo-oooom! If I wear my coat no one can see my costume! !”) we’d all congregate on the floor of someone’s living room and pour our bags of cheap treats out on the floor to sort and count and trade. I always liked this part the best- we were like little pirates, or maybe bankers, gleefully portioning out the gold coins. And now that I have kids, they do this. Monday night our gaggle of kids racing ahead and dutiful parents lagging behind all trooped back to my friend Katrina’s house where the kids immediately took over the living room by unceremoniously dumping several tons of high fructose corn syrup in a variety of colorful wrappers onto her carpet. A frenzy of sorting and showing off and bartering began. Meanwhile, Katrina’s dog Inky was wasting no time. Ignoring the candy completely, he made like a Hoover vacuum when an entire baggie filled with popcorn ended up on the floor, deftly maneuvering around the Tootsie Rolls and tiny boxes of Junior Mints. I laughed when I saw that our friend Robin had brought homemade mini-cupcakes along for everyone. It reminded me of the Farmer’s Market last weekend when virtually every vendor was plying my children with candy- pressing Starbursts and — into my hand before I could say no… of course they went directly into the trash when we got home. 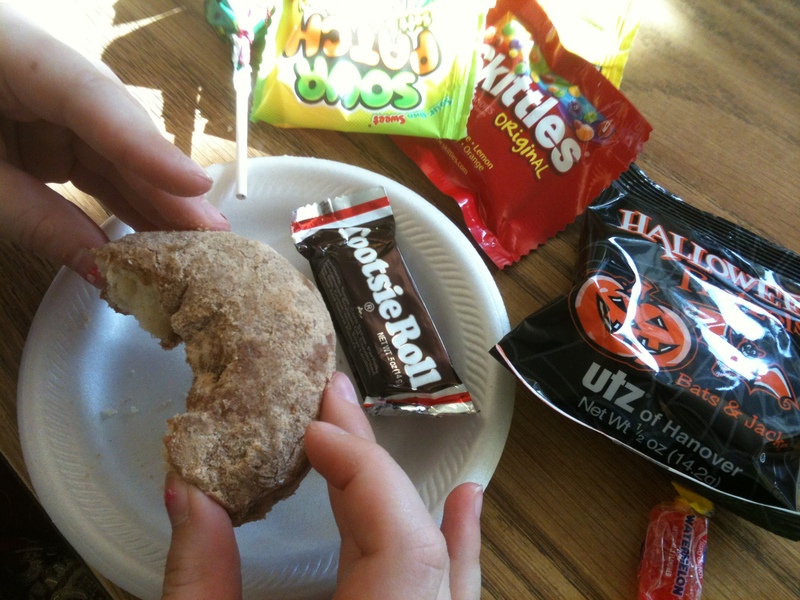 Nonetheless, I have to admit I was astounded on Halloween day to walk into my older daughter’s sixth grade classroom to find all the kids having a Halloween treat consisting of a sugar doughnut and a large handful of assorted candy. My eyes got big. What, did they not feel tonight was going to be sufficient? Did they have to be primed with sugar, pre-event too? People just can’t seem to help themselves when it comes to the idea of making a child happy. And what easier way to make a child happy than with an inexpensive little bit of sugar? Of course, the problem is, it’s too easy, so everyone everyone EVERYONE wants to get into the act. Robin’s adorable, homemade cupcakes aren’t the problem, it’s all the junk which likely came before that, and will likely come after that too. I know I sound like a broken record, but I truly do think that we’ve simply forgotten that everyone loves to see that smile on that kids face… everyone loves the feeling of making a kid happy. What we need to realize is that it has become SO cheap and SO easy to hand a child a treat, that inflation has set in. No longer is it sufficient for the teacher to bring the kids doughnuts- there has to be a pile of candy next to it. No longer is it sufficient for kids to get a single treat at each house, now many houses go to the trouble of packing little paper candy bags full of several treats each. No longer is it sufficient to have a treat or two (or fourteen) from the candy bag that night, we have to provide dessert on top of that. Because, what else do you do? It’s Halloween! Or Christmas! Or Valentine’s Day! Or somebody’s birthday! Or you’re just feeling depressed! Or happy! You see what I’m getting at here. Sweet Poison author David Gillespie told me that he’s always interested to watch what happens to American kids after Halloween: they all start getting sick. Sure, you could blame it on the change of temperature, but what if it’s not just that? Would we all be so quick to dole out those easy-to-come-by bits of happiness to children if we knew it was going to hinder their immune systems? Would we view it the way we view handing out free cartons of cigarettes to soldiers now? Then again, I still love Halloween. I spend much of the month of October getting ready for it, picking out costume patterns and fabric with my children, and then sewing like a madwoman. When the appointed night comes, we venture forth, armed with flashlights and reflective tote-bags and cameras, not to mention the optional umbrellas or long-underwear . We tromp around West Pawlet Village with our friends, often running into other groups and joining up like packs of amiable, gaudily-dressed and highly-supervised wild animals. As we all looked around blankly, trying to discern what exactly was going on, it became clear that my friend Sue was orchestrating something. All thirty or so of us large and small and costumed and not put down our flashlights and bags of candy and joined hands. Once we were all in an enormous circle, Sue let go hands at just one spot so we formed a curved line. Then she began walking around the interior of our circle, making a spiral inward, inward. And because we had all joined hands, we were all walking too, following her, passing each other, giggling and making faces and talking to one another animatedly. Once she got to the middle-middle-middle and could go no further she turned 180 degrees and began to walk a spiral back out again. Have you ever done this game? It seems like something I must’ve done at camp or elementary school or something, but never, never had I done it on a moonlit night in the parking lot of the West Pawlet Fire Department with a group of parents and children I love so well. And never before with a group of tiny Mad Hatters and queens and monkeys and fairies and zombie monsters. As we spun around and around the wheel of our friends and children, it felt like we had joined the witches themselves to perform a rite of autumn. It felt positively pre-Christian. Isn’t it something like this- that is so much harder to achieve than that fleeting bit of happiness that comes in a plastic wrapper- that we really want from our holidays? A sense of connection, of community, of ritual, of transformation? You can’t buy that by the bag down at Rite Aid, and I suppose that’s how it should be. I love your video, Eve, it reminds me of the circle dances the ancients used to do and some still do today. They bring people closer, I think. This sugar thing is like a madness in our society, the original Australians used to be a very slim race until the English got here and “civilized” them by giving them white flour and sugar. They are now an obese race. So sad really. I love following your posts, I have been free of sugar for 9 months now and my husband (less obsessively) for 6. I feel terrific and have dropped a lot of weight. He has now got much lower cholestoral and sugar levels. I look forward to your posts. I certainly enjoyed the one where you met David Gillespie – lucky you! You are currently reading A Year Of No Sugar: Post 80 at Eve O. Schaub.